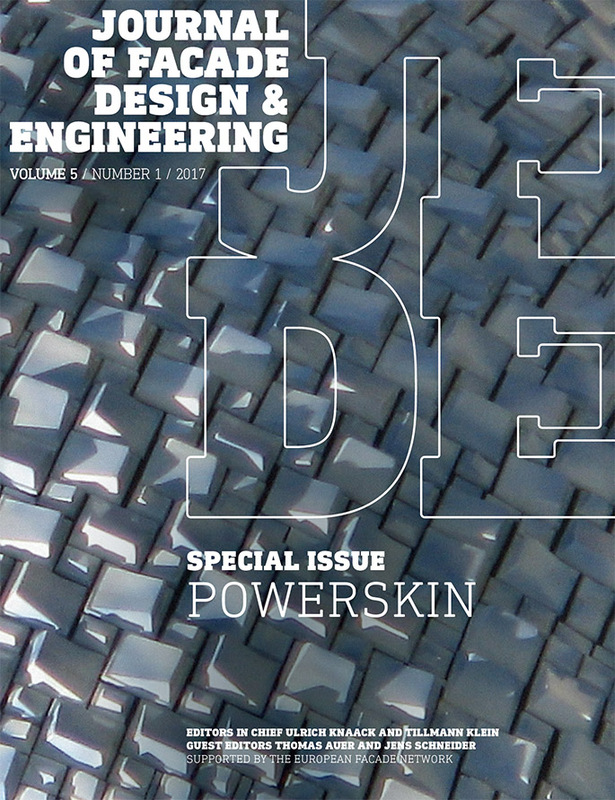 This issue is the result of the facade conference Powerskin, held on 19 January 2016 at the building tradefair ‘Bau’ in Munich. The conference was organised in a cooperation of TU Munich, TU Darmstadt and TU Delft. All three universities maintain a facade research and education unit on building envelopes. The conference featured a mix of practice and education related and scientific contributions. Again, JFDE was chosen as the platform to publish a selection of scientific papers. A total of 22 abstracts were reviewed of which 17 were pre-selected. From those, we received 13 papers that had been subjected to our strict double blind peer review process. A final selection of 9 papers forms this issue. We thank our guest editors Thomas Auer and Jens Schneider who have been key partners in creating this special issue. As discussed in the last editorial, we have successfully completed the NWO funding period (Netherlands Organisation of Scientific Research) to start up JFDE. Open Access publishing strongly depends on author publishing fees and the introduction in our scientific ((field?)) needs some more time. In search of a new business model, we proudly announce that we have found two partners wo believe in the relevance of JFDE. The Society of Facade Engineering SFE is a joint initiative of CIBSE, IStructE and the RIBA with the aim to create a forum to advance knowledge and practice in facade engineering. CWCT It is an industry funded centre and a leading information provider and trainer in the field of building envelopes and glazing. Both organisations acknowledge the need for an independent scientific publishing organ which will contribute to the development of the field of facade design, engineering and construction. This support enables us to continue JFDE. We want to thank the publisher IOS Press and especially Mark Eligh to have guided JFDE to the level where it is now. This issue is the first published by TU Delft Open, a publishing house established by the TU Delft Library. We will continue to deliver high quality contributions with the aim of 3 issues per year. Thank you for supporting JFDE. In order to meet the Swedish energy efficiency objectives for the built environment until 2050, a particular building stock has to be addressed: the houses of the Million Homes Programme, an ambitious housing programme of the 1960s and 70s that resulted in a large number of standardized multi-family houses all over Sweden. These are in need of upgrading the energy and comfort quality to current standards, which provides an excellent opportunity to investigate the potentials of ‘prefabricated multi-active’ façades for refurbishments on large scale. While ‘prefabrication’ is linked to cost-effectiveness and high replicability, ‘multi-active’ addresses the potential of embedded active and passive measures for improved energy efficiency and energy regulation out of the façade. Integrated building services technologies, solar technologies or moveable components, such as shading systems, are considered active measures. Passive measures include physical and constructive measures, such as e.g. thermal insulation or selective coatings of glazing’s, and provide a “passive” energy flow control to improve the thermal quality of the building envelope. Many of these strategies are well-known, traditional solutions. Although they do not provide an energy-generating or -supplying function, they dynamically interact with environmental changes; preheating of supply air through the air cavity of a façade construction or adaptive thermal buffer zones are just few of many examples. 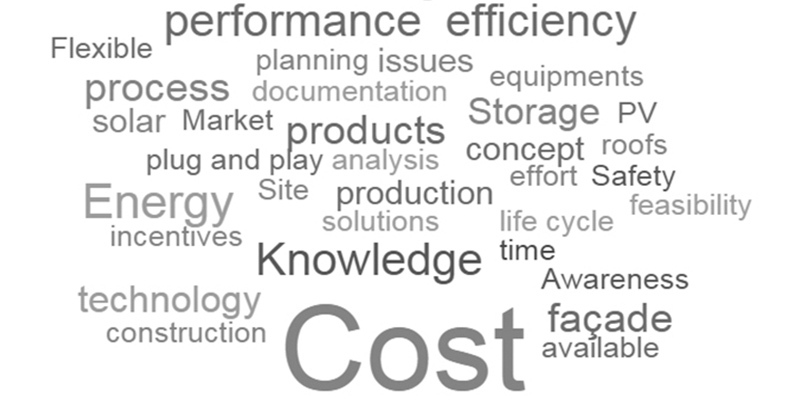 The question is how traditional passive strategies can be used to contribute most effectively to the demanded energy efficiency. The paper presents first results from an assessment dealing with this question: Two traditional ‘passive’ façade strategies, a curtain wall system and closed balconies, have been analysed in regards to their impact on energy balance and their thermal behaviour in a defined renovation scenario. The assessment is aims to support the development of a multi-active facade concept suitable for large-scale refurbishments of the multi-family houses in Sweden, which is part of the initial phase in the pre-study “Multi-active façade”. The pre-study considers architectural, technological and constructive aspects, energy performance and indoor comfort optimization, but also economic feasibility and constraints to get replicable on large scale. So-called added values that concern the upgrade to modern living standards and expectations by inhabitants and the market value of the building are also touched. The paper discusses, based on a technology screening to identify suitable key measures, the energy saving potential and impact on thermal indoor comfort of two passive renovation strategies for facades. A modular multifunctional façade for the retrofit of shopping malls, capable of adapting to different climates and to the existing building features both by the presence of movable components and by proper sizing of the fixed ones, is under development within the European FP7 project CommONEnergy. In particular, this curtain-wall façade is equipped with a fixed shading system, a photovoltaic panel with a battery feeding the automated openings for natural ventilation. The aim of this work is to define a reliable parametric model for a multi-functional façade system, to support designers with a set of useful data for the holistic design of the façade configuration depending on climate, orientation and building use. Firstly, a reference zone model for the façade was devised; this had to be both representative of reality and smartly defined for simulation software implementation. Besides the definition of the façade model parameters, all unknown design parameters were identified with their minimum and maximum values, depending on different possible applications and environmental conditions in which the façade could be applied. The inputs for the model were defined in a parametric matrix and included: facade module size, façade orientation, climate, window typology (thermal transmittance and g-value), distance between the shading lamellas, tilt angle, and openable window size. The simulation engine was decoupled: visual comfort and artificial lighting use were assessed with Radiance, while the façade thermal behaviour was evaluated by means of building energy simulations in TRNSYS, taking into consideration the daylight assessment results. For each simulated configuration, a set of relevant outputs fields for Indoor Air Quality, thermal and visual comfort, and energy performance were derived. The main considered performance indicators were the long-term percentage of people dissatisfied, the number of hours when CO2 concentration was within the recommended values for each of the categories defined by EN 15251:2007, the illuminance provided by daylight, the energy consumption due to lighting, ventilation, heating and cooling, and the energy generated by the PV panel. Moreover, all outputs were collected in a pre-design support tool comprised of a database accessible through a filtering system to gather the desired performances. This work highlights the role of thermal and daylighting simulation in the design of an adaptive multifunctional façade through the definition of a methodology for the support at the pre-design phase. The last decades have been marked by a growing concern over scarcity of resources caused by the rapid industrialization of emerging economies as well as by the high material consumption at a global scale. These changing environmental conditions have inevitably created new challenges and demands for mediation of the interaction between the natural and the human-made environments. In response to these challenges, designers are currently moving away from conventional top-down design, towards a nature-inspired approach in search of the underlying principles of morphogenesis and materialization inherent to biological entities. 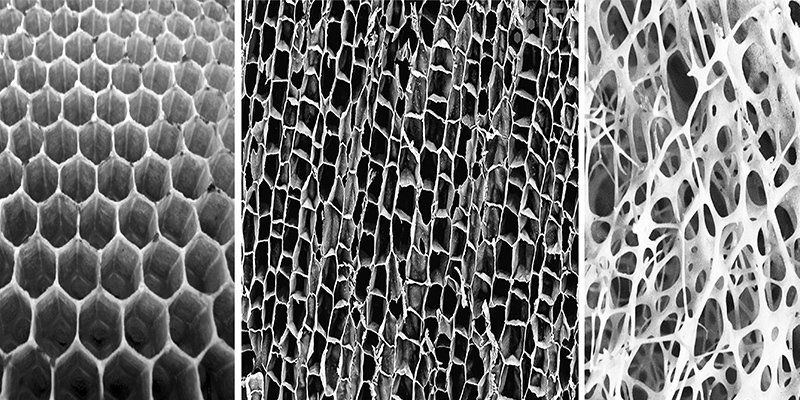 Inscribed in this approach, this paper proposes an innovative design-to-fabrication workflow for the conception of nature-inspired load-responsive skin systems which integrates the use of computational tools, Additive Manufacturing, and material experiments with full-scale prototypes. The design phase employs custom algorithms to determine an optimal material distribution for free-form architectural shapes, given a specific loading condition. Through fabrication tests at different scales, the viability of a production system based on Fused Deposition Modelling is demonstrated. Subsequently, the realization of a final prototype of a load-responsive cellular envelope cladded with Fiber-Glass Reinforced Plastic is presented. Opportunities and current limitations of the approach and the emerging architectural system are critically discussed towards future developments. Solar energy has been actively promoted as a clean energy source since 1973’s oil crisis, evidenced by the emergence of initiatives such as the Solar Heating & Cooling Programme of the International Energy Agency or the US Department of Energy. Nonetheless, solar technologies have not been widely used in the built environment, limiting their operation to industrial and macroscale applications. Commercially available products such as building integrated PV panels (BIPV) or building integrated solar thermal collectors (BIST); and novel prototypes and concepts for solar cooling integrated facades are seen as interesting alternatives for the development of new performance based façade components for high-performing commercial buildings. However, there are barriers to overcome in order to promote widespread application of architecturally integrated solar components. The present paper seeks to discuss perceived barriers for widespread façade integration of solar technologies, in order to define the current scenario and generate guidelines for future developments. In order to achieve this, the paper presents the results of a survey addressed to professionals with practical experience in the development of façade systems for office buildings, situated at any stage of the design and construction process. Hence, architects, façade consultants, system suppliers and façade builders were considered. The outcome of this study is the definition of the main perceived barriers for façade integration of solar technologies, discussing the results from the survey along with other related experiences found in the literature. 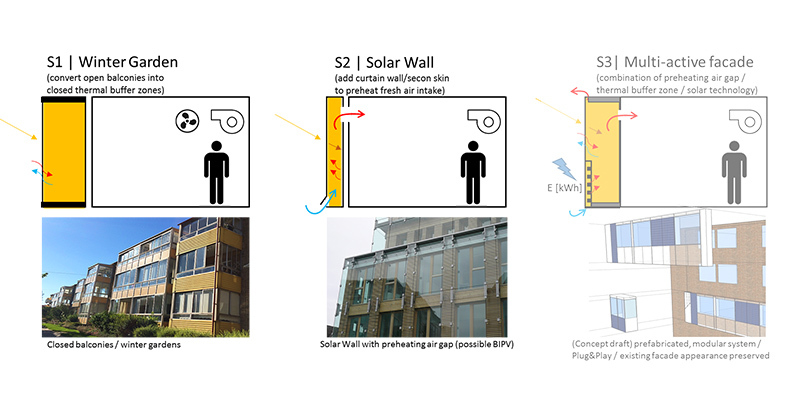 This study is part of the ongoing PhD research project titled COOLFACADE: Architectural integration of solar cooling strategies into the curtain-wall, developed within the Façade Research Group (FRG) in the Green Building Innovation programme (GBI) of the Faculty of Architecture and the Built Environment, TU Delft. The increasing migration into cities leads to an increasing number of people stressed by noise. More and more people are moving into urban settings comprised of multiple noise sources and hard reflective glass and steel facades. 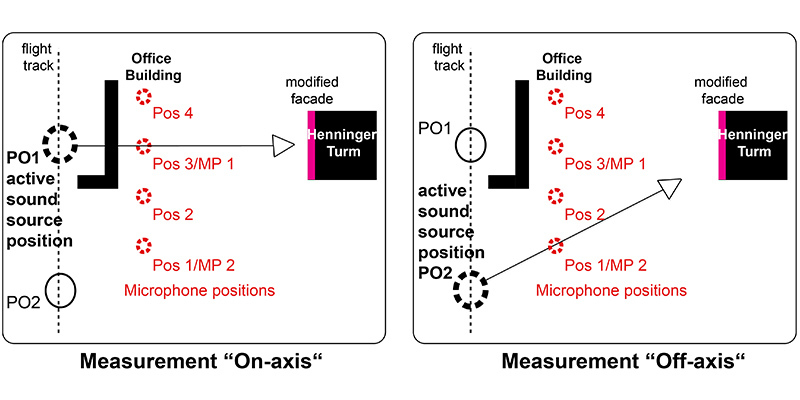 The omnidirectional arrangement of noise sources like airborne noise or car traffic noise and their reflection on the facades neither composes urban arrangements with silent indoor areas nor comfortable quiet areas outdoor. To come up with requirements for silent areas inside and outside of buildings further design parameters have to be introduced. The facade is not only a shelter for the inside it can also provide comfort spaces outside the building. As engineers and architects we cannot change the noise source, but we can influence the impact on the surrounding urban space by controlling the reflection of noise emissions on the urban surfaces like facades. 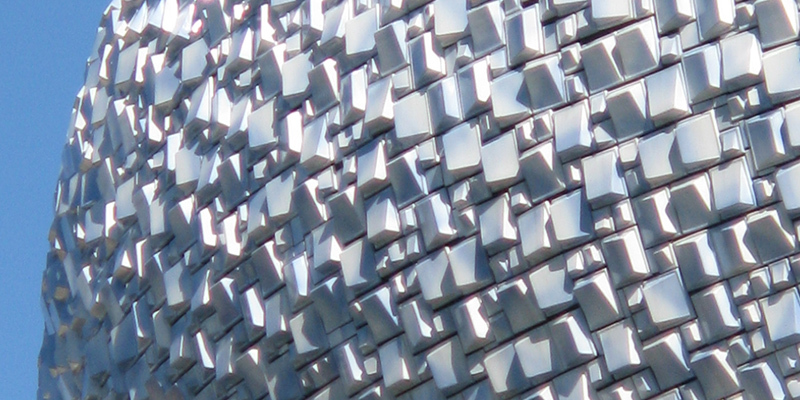 In a facade design the capability of reflecting noise can be tuned by modifying the surface. In order to come up with the acoustical needs no radical new way of facade design has to be introduced. Mainly a shift of attention to the acoustic parameters is needed. Based on acoustic measurements of basic geometry principles this research presents known facade designs and their acoustic parameters regarding the reflection capabilities and the functions in a facade. “Architecture Fully Fashioned” is about lightweight design and new textile based building skins. Fully fashioned refers to a textile production technology wherein all parts of a piece of cloth are produced in one integrated production process, ready to wear the moment they leave the machine. Fully fashioned powerskin in an architectural sense implies a light, highly prefabricated textile envelope with minimum needs of installation work on the building site. To develop these new textile powerskins, experimental student works and applied research projects at Frankfurt University of Applied Science investigate the potential of the combination of textile technologies with foaming technologies. This paper focuses on so called spacer fabrics and a research project called 3dTEX and founded by Zukunf Bau, where wall elements from foamed spacer fabrics presently are under development. 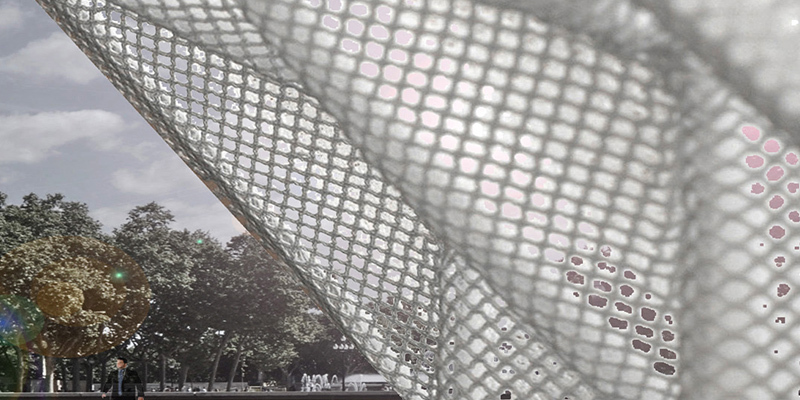 The aim of the paper is to present 3dTEX within the context of the accompanying experimental student design works and to show the so far achieved results for a prefabricated, lightweight, self supporting and highly insulated foamed textile skin, with reduced needs of installation work on the building site. This has been achieved by using the spacer fabric as lost formwork and using 3d-textile technologies, so as woven or warp-knitted spacer fabrics, in order to receive complex geometrical sandwich-like textiles. Together with the foam they become FabricFoam©. The new selfsupporting building elements not only offer possibilities for complex architectonical geometries including loadbearing structures, but also a wide range of surface designs in terms of structures, colours and additional functionalities. The focus of 3dTEX is on the development of appropriate textile geometries for one- ore two-layer textile elements, depending on the choosen textile technologies. Foamed, they become lightweight, insulated elements, where the two layer textile can even be transformed into a ready-made, rear-ventilated, insulated wall element made from gradient fibre and foam material, able to absorb tensile and compressive forces at the same time. The challenge for 3dTEX is to close the knowledge gap about what kind of textile technology can produce the envisioned textile geometry with which kind of fibre material. Further, 3dTEX research is about the appropriate, possibly in-situ, foaming technology and foam material, so that fibre and foam materials match as an aesthetic architectural element and in terms of mechanical and building physics as well as in terms of grey energy and recycling aspects. The majority of the photovoltaic (PV) modules used in building skins contains glass, but does not entirely comply with the product standards and design rules for glass in building. As a result, structural applications are subject to individual approval by the building authorities in many cases. This paper presents experimental research on glass based photovoltaic modules, analysing their mechanical properties in comparison with approved construction products. 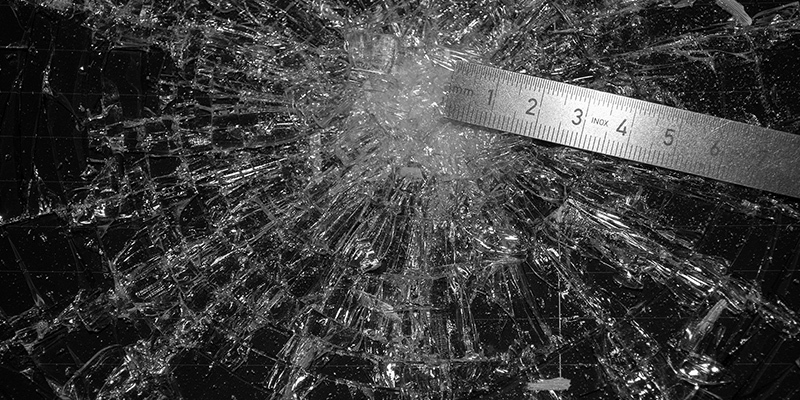 The focus is on glass-glass modules and on the question whether the most common module configurations can be classified as laminated safety glass. Testing included residual resistance testing to study the potential to provide residual load-bearing capacity and shear testing to examine the interaction of photovoltaic cells and interlayer material as well as adhesion characteristics. If approved interlayers are used, glass-glass modules correspond to the safety level of laminated safety glass, because the PV integration does not impair breakage behaviour and improves residual resistance, while the observed reduced adhesive bond does not imply a higher injury risk. 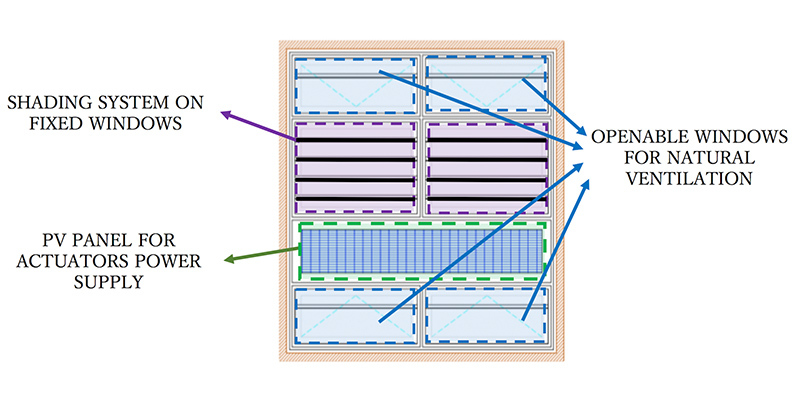 Formal classification of photovoltaic products within the product and design standards for glass in building could facilitate the use of building-integrated photovoltaics. Life-cycle assessments of photovoltaic systems so far concentrated on roof-top and ground-mounted installations. Based on these studies, the specific environmental performance of building-integrated systems was analysed. Constructive integration of the PV modules associated with the substitution of conventional materials in the building skin reduce the life-cycle environmental impacts like primary energy demand and greenhouse gas emissions, especially in those areas with suboptimal solar irradiation like façades. The net energy payback times calculated for Central European range from 0.8 and 5.6 years and the net carbon footprint varies between 12 and 192 g CO2-eq/kWh. This paper reports on the research-driven design process of an innovative thermal mass concept: Convective Concrete. 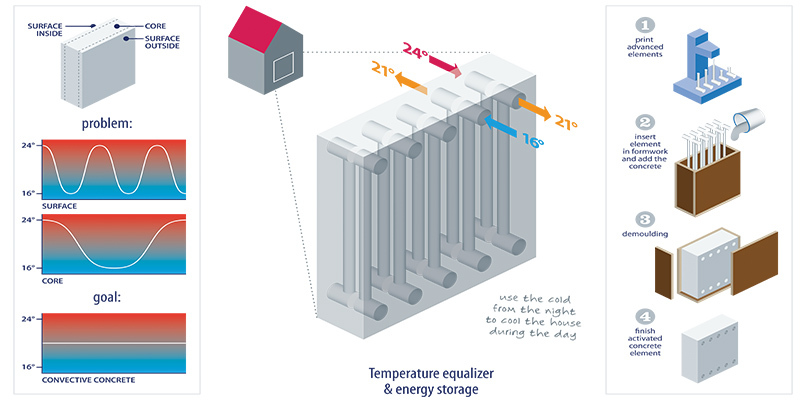 The goal is to improve building energy efficiency and comfort levels by addressing some of the shortcomings of conventional building slabs with high thermal storage capacity. Such heavyweight constructions tend to have a slow response time and do not make effective use of the available thermal mass. Convective Concrete explores new ways of making more intelligent use of thermal mass in buildings. To accomplish this on-demand charging of thermal mass, a network of ducts and fans is embedded in the concrete wall element. This is done by developing customized formwork elements in combination with advanced concrete mixtures. To achieve an efficient airflow rate, the embedded lost formwork and the concrete itself function like a lung. The convection takes place with separate pipes on both sides of the concrete’s core to increase the charge/discharge of the thermal storage process. The first stage of the research, described in this paper, is to simulate the Convective Concrete at the component level, whereupon a mock-up is tested in a climate test set-up. The paper concludes with describing planned activities for turning this concept into a real building product. The paper illustrates the use of aerogel technology in façades to reduce thermal bridging and limit condensation. Additionally by mitigating local thermal bridges the indoor climate, especially draught and molds creation, can be eliminated as the surface temperature increases and prevents these negative factors. Curtain walls, in comparison to opaque wall, are often not designed in an energy efficient way and can be large contributors to heat loss of buildings. This is common for curtain walls in Asia and North America, where the energy requirements are not as demanding as in Europe. Building envelopes have many details which can easily introduce thermal bridge due to limited space of insulation or incorrectly solved construction detail. 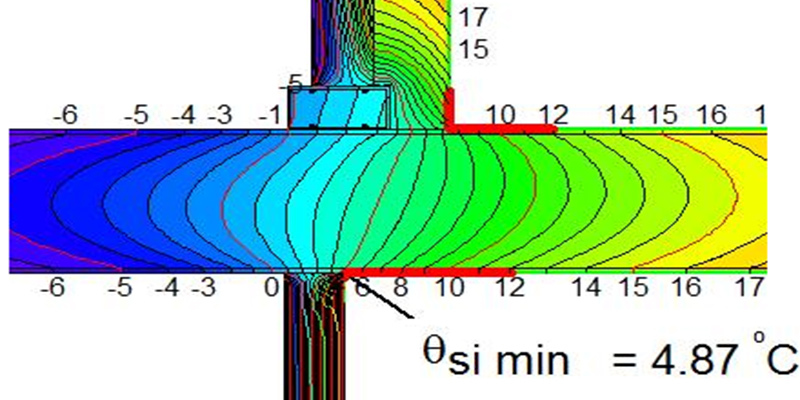 The heat flow through a poor thermally-performing detail, e.g. exposed concrete slab, could account for over 40% of the heat loss of the façade. The contribution of a well-insulated slab could be less than 10%. Unfortunately, traditional insulation techniques are often not suitable due to limited installation space. This paper discusses several case studies whereby the performance of a reference case is compared to a case with a thermally optimized façade implementing Building Insulation Blanket (BIB), which uses silica based aerogel technology. The thermal conductivity of BIB can be as low as 0.015W/mK, and together with its high flexibility and fire resistance enables new design possibilities. The use of BIB in the case studies, contributed to the reduction of overall curtain wall thermal transmittance up to 30%. Additionally condensation risk was significantly reduced.